OMGosh....my box of catties came late yesterday and I was completely distracted by those things---actually I still am LOL!! Don't abandon me yet please...I couldn't get any good pics of the project we're doing today and since I worked on finishing mine before I was distracted---I didn't get a chance to make any new challenge cards. Add on the fact that I cooked, did laundry, babysat, shoveled my driveway and the entire sidewalk in front of my house and the next street over to my neighbors' home---we're on the corner....I totally didn't have time!!!!! Sooo, I'm posting another creation from last year....for those of you that follow the challenges on SCS; you may recognize these Pixie Stick Holders or in my case...Chocolate Stick Holders! I decked mine out for Valentine's Day using 2 of my fave sets Happy Heart Day & Priceless. Added lots of bling, some flowers & ribbon....voila all done!!! I'm really happy you stopped by today in spite of the fact that I haven't created anything new yet! When my class is over, I'll have the opportunity to create something before I stick my head back into my book....after I distract my kiddos since they're home from school today due to inclement weather. Have a great rest of the day! Don't matter if you post a card or just chatter, I'm still here everyday! Boy you sure were busy. We've gotten over a foot of snow & the temp - right now - is -23 with wind chill of -45! OMG! I've never in my entire life (62 yrs) have ever seen it this cold other than in the news of Siberia (way back when). The world is sure changing. At least here I get a smile put on my face so keep 'em comin' girlfried! This is so cute! I've never made a pixie stick holder before. I'll have to try one sometime. Isn't the new SU catty great? I think its the best new catty in years! Fabulous new stamp sets. I just wish we weren't in a recession right now so I could buy more! LOL! You just have too much on your plate and need more stamping time *LOL* Love that stamp set and how everything turned out. Its so pretty. Jackie, this is adorable! I pulled this set out the other day so I could start making cards with it. It's one of my favorites! You have been one busy lady! We too are on a corner about 200 ft. of side walk beside a double driveway. We had a dusting of snow last night and with the bitter cold, not sure if I will the wind blow it away or try to sweep. The law here is that sidewalks must be clean, not always easy with a bad back, arthritis and a sick husband. No wonder I don't like winter! Getting to old for all of this! OMGosh! This is great, Jackie! Thanks for the warm welcome to the blogger 8 group! I am so excited! Oh my- this is so sweet, love the colors. I know what you mean cold, it is about -10 today and I don't like it one bit. Great project! I understand how busy life can be (: Stay warm! How cute is this? Great job! Don't you just love the new catty? I got mine the day before yesterday. So much new cool stuff! This is so pretty! I completely understand how busy you are. Stay warm. Boy have you been busy! And to think when I got up this morning I got "dressed" in a nice warm pair of PJ's for the day. Congrats on getting your catalogs! This holder is darling. So cute! You sure have gotten your money's worth out of that set. Whew girl, go take a nap! What a busy day and a wonderful card! How cute. Love to way you used the priceless heart to make a coordinating panel. BTW, I left you something on my blog! 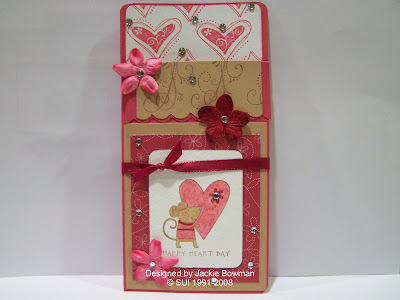 How pretty, Jackie...I love the long design and the gorgeous colors and images!!! I had to laugh at your post because I have had my nose in a catty all day, too!! My DD brought me one last night and I already have a list as long as my arm...yikes!!! Stay warm!! Your card is adorable Jackie! What a really fun design! Have a wonderful weekend! What a fun project! Love the papers, stamps and flowers! TYFS!